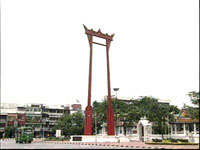 The Bangkok Metropolitan Administration has launched a three-day celebration of the new Giant Swing located in front of the Bangkok City Hall. The king and queen presided over the inaugural ceremony of Bangkok’s refurbished Giant Swing on Wednesday. The Giant Swing has undergone several renovations since it was built in 1782, with the latest restoration beginning four years ago. The celebrations will feature a wide range of cultural performances, although the ceremony for which the Giant Swing was most known in the past will not take place. Until it was discontinued in 1935, a dangerous ceremony involved teams of men who would ride the swing on arcs as high as 25 meters above the ground, without any safety measures, using their teeth to grab a bag of silver coins hung in the air. The Bangkok Metropolitan Administration has launched a three-day celebration of the new Giant Swing located in front of the Bangkok City Hall. The king and queen presided over the inaugural ceremony of Bangkok's refurbished Giant Swing on Wednesday. The Giant Swing has undergone several renovations since it was built in 1782, with the latest restoration beginning four years ago. The celebrations will feature a wide range of cultural performances, although the ceremony for which the Giant Swing was most known in the past will not take place. Until it was discontinued in 1935, a dangerous ceremony involved teams of men who would ride the swing on arcs as high as 25 meters above the ground, without any safety measures, using their teeth to grab a bag of silver coins that hung in the air.